Joey LaLeggia leads a tough Denver team against Miami in Oxford. After a week spent licking its wounds following an embarrassing sweep at the hands of then seventh place St. Cloud State, 9th ranked Miami (14-8, 7-5 4th NCHC) jumps into the final stretch of the regular season with a challenge from #11 Denver (13-7-1, 6-5 5th NCHC) in Oxford. For Miami, these are the first home games since December 5-6 when they split a league series against Omaha. 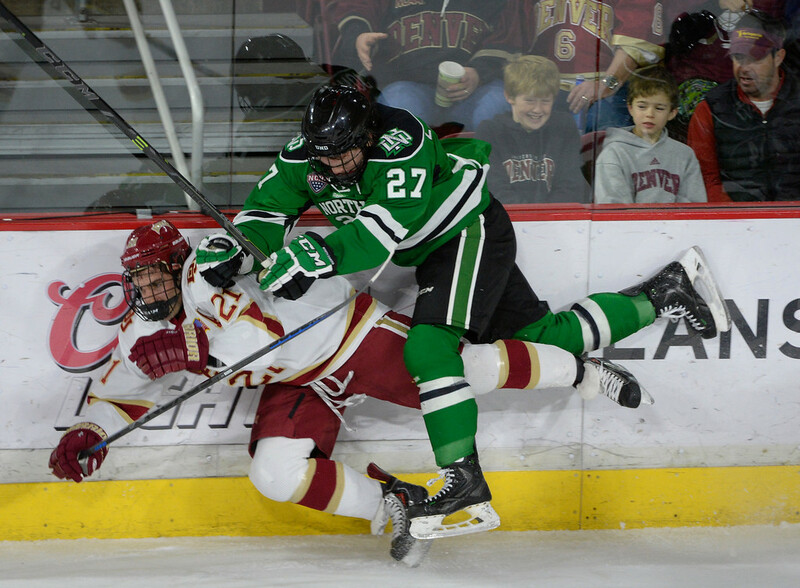 After five meetings last year, these are the first of the 2014-15 campaign and first since Miami’s 4-3 loss to Denver in the NCHC championship game in Minneapolis last March. Last season, Miami and the Pioneers split four regular season meetings before Denver prevailed in the title game propelling DU to the NCAA tournament where they were routed by Boston College in the first round of the Dance. This weekend’s NCHC series against DU is the start of a brutal final month-plus of the regular season as Miami will next face Western Michigan (@Kalamazoo, @Chicago/Hockey City Classic) followed by Colorado College (road), Minnesota-Duluth (home) and Denver again (road) before finishing the regular season with a home series against North Dakota on March 6-7. Miami trails the all-time series with the Pioneers 7-6 including a 1-1 mark against Denver in NCAA tournament games. Maine alum Jim Montgomery is in his second season behind the DU bench after replacing legendary head coach George Gwozdecky before the start of last season. Overall, Montgomery is a modest 33-23-7 in his season and a half with the Pioneers and the program is still really looking for the spark I feel they lost in making a mistake by firing Gwozdecky. Having seen Denver twice in person, they are a smooth skating, puck-moving team with decent size and goaltending. In a 4-1 victory over outmanned RPI, Denver was dominant. However, in a humbling 3-1 loss to North Dakota, the Pioneers were exposed by speed and stretch passes as UND dominated from start to finish. Denver was soundly defeated by North Dakota last month. Miami should attempt to replicate UND’s formula for success this weekend. So, a mixed bag, perhaps. What I will say is that Miami needs to get out in space and challenge the DU forwards to backcheck. It was either an off-night or the Pioneers don’t care much for defensive play so perhaps Miami can use that to its advantage. Offensively, the Pioneers are led by freshman Danton Heinen (9-16-25) and last year’s leading scorer, sophomore Trevor Moore (9-11-20). On the blueline, junior Joey LaLeggia (8-12-20) leads a stellar group of puck movers and is a player Miami must keep tabs on, particularly on the powerplay. In net, the Pioneers have split minutes between sophomore Evan Cowley (2.09 GAA, .924 SV, 14 GP) and freshman Tanner Jaillet (2.01 GAA, .920 SV, 12 GP) to almost identical results. Cowley was thought to have been on the short list to make this year’s US WJC team, but was one of the final cuts before the team skidded to a 5th place finish. Frankly, I thought Cowley should have gotten the nod before Brian Halverson who saw little action backing up Boston College’s Thatcher Demko. Overall, this is a big, fast Pioneer team and Miami will have its hands full. Expect to see both Crash Cousins in the lineup this weekend as Enrico Blasi attempts to get favorable line matchups with the final change. This is a series Miami needs to sweep. The first two home games in well over a month. Coming off that embarrassing sweep. Despite the fact the students are still on break, I say Miami shows its heart and finds a way to get a tough NCHC series sweep over the Pioneers. Posted on January 23, 2015, in 2014-15 and tagged college hockey analysis, Denver Pioneers, Enrico Blasi, Jim Montgomery, Miami RedHawks, NCHC. Bookmark the permalink. 1 Comment.